Say 'Privyet' to Vodka Fuelled Fun! Vodka might well be the most popular liquor in the world. Russians tend to drink it on its own, but less crazy people have found that vodka also goes well with all manner of juices and fizzy drinks. And then there's vodka jelly, which has become a bit of a party favourite in recent years. You have to be careful when you make vodka jelly; if you use too much vodka then the jelly won't set, but if you use too little, well, you might as well just be eating jelly. And that's no fun. So if you think you can master the art of the vodka jelly, grab yourself a vodka jelly mould and give it a go! Our jelly mould is shaped just like a vodka bottle, so your party guests can be sure that they're not wasting their time on boring, 'normal' jelly. 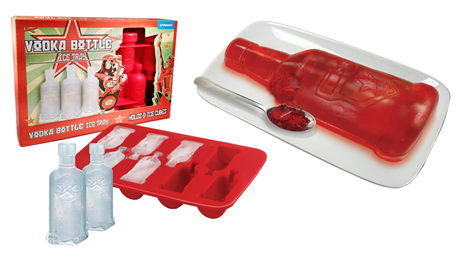 And if you prefer to take your vodka in liquid form, perhaps you'd prefer this cool vodka bottle ice tray! Just fill it with water, stick it in the freezer, and before long you'll have eight of the coolest ice cubes you've ever seen! Each one is shaped like a vodka bottle, so whether or not there's actually any alcohol in your drink, you can always have a bit of vodka in there. Sadly though, you won't be able to make actual vodka ice cubes. Vodka freezes at around minus 27 degrees Celsius - probably a fair bit colder than your freezer can manage! Want some pet stuff, eh? You're barking up the right tree! Gadget Inspector doesn't just cater to humans, y'know. If you've got a cute cat or a playful pooch, we've got a fantastic selection of pet accessories that are sure to keep them happy! So give your canine chum a special pet stuff treat and swap that dirty old dog dish for a brilliant bone bowl! And don't worry about your cat getting jealous - we've got pet accessories for her too, and she's bound to love this colourful fish dish! Both of these novelty feeding stations have two bowls (food and water), and they come in a huge variety of colours! We also stock the Sasquatch Pet Bed. They look like giant shoes, but they're really the ultimate pet accessories, giving your pet a cosy, comfortable place to take a nap. Blimey, this pet stuff is almost as nice as our human stuff! So grab a couple of great pet accessories for your furry friends today. Or you could just dress them up in a little devil costume. There are very few objects left in the world that can't plug into a PC. From musical instruments to fondue sets, pretty much everything has a USB port nowadays, and while mice and keyboards will probably always be the most frequent visitors to your hub, we've got plenty of other unique USB gadgets with which to fill up those holes in your computer. So how about turning your USB hub into a resplendently retro cassette tape? Or replacing your rubbish laptop speakers with a splendid pair of scarlet stiletto speakers? All of our USB gadgets are easy to use, and they're sure to look great next to your computer. 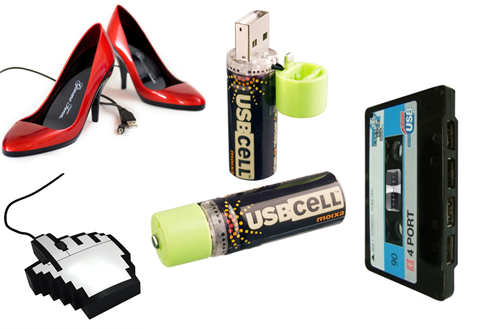 Whether you fancy some rechargeable USB batteries or a nifty USB handwarmer [no longer available] for those cold days at the office, our range of USB gadgets is sure to have something for you. Going On Holiday? Don't Get Caught Out! Our gadgets and gizmos could save you a bundle! September is almost upon us, but there's still time to squeeze in a quick summer holiday before autumn arrives! But what to pack? Airlines are pretty strict with their weight restrictions nowadays, and if you are popping off for a last-minute holiday, knowing that your hand luggage is comfortably below the limit can be a real load off your mind. The bathroom scales can give you a rough idea, but who knows how accurate those old things are? Well you can leave the scales in the bathroom, because Gadget Inspector's range of cool stuff has come up trumps again! Our digital luggage scale is the perfect gadget to have handy when you're packing your bags, and it's sure to save you a pretty penny in airport charges. The luggage scale is super easy to use: just switch it on, attach the strap to your suitcase's handle, and lift it up. The weight readout locks after two seconds, after which you can put your luggage back down and find out if you've overpacked! So don't let there be any doubt at the check-in desk - grab a handheld luggage scale, and have a trouble-free holiday. There are very few problems that can't be solved with a healthy dose of cool stuff from Gadget Inspector, so head over to our Gadgets & Gizmos section see if there's anything you fancy! Get competitive with a bit of beer pong! If you want a way of turning a few quiet pints into all-out war, beer pong is the game for you. The premise is fairly simple: if the ball's in your cup, drink it all up! The aim is to throw the ball into your opponent's cups and force him to empty all of his before you've emptied all of yours. Beer pong has become immensely popular at parties everywhere, and it's spawned a lot of variations, but no matter how you're playing it, you're always going to need the essentials - the table, the cups, the balls, and the beer. We're not licensed to sell you that last one, but we've got the other three in spades and they're blimmin' brilliant. Better yet, our beer pong table glows in the dark, meaning that you can have some frantic beer pong fun with the lights out! Beer pong is a great way to knock your party up a notch, so don't hang around - get your order in now!